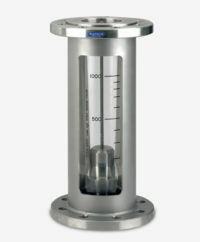 The Kytola Model TT variable area flow meter offers reliable, accurate flow monitoring in industrial applications. Its stainless steel (AISI 316) body protects the impact-resistant acrylic flow tube, providing an easy to read scale with maximum durability. With a capacity for up to 1000L of water a minute, the Model TT is typically used in water treatment facilities, power plant environments and commercial swimming pools. For optional features, please call our team to discuss your requirements.